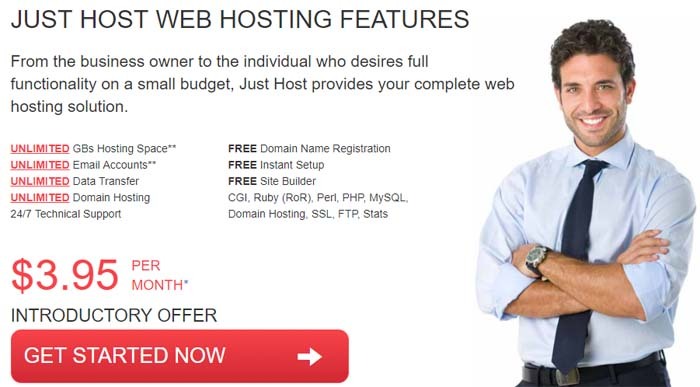 Buy PLUS Web Hosting at justhost.com with 150 GB website space and 10 websites. Basic Web Hosting with unmettered bandwidth and 50GB Website space. What is the Just Host Money-Back Guarantee? Just Host wants you to be absolutely sure that it is the right platform to host your website. As is standard with most hosting providers, there is a 30-day money-back guarantee. In this period, customers can try out the plans and see if it works for their website. If you choose to cancel the plan within 30 days of signing up, you will get a refund minus any domain charges or any add-ons you may have purchased with the plan. I applied a coupon code at signing up for web hosting. Will my plan be renewed at the same rate? Unfortunately, that is not the case. Promo codes basically offer introductory prices for when you start your website or move it to Just Host. After the first term ends, the contract is renewed at regular rates. However, regular rates are not that higher than the discounted rates as their pricing is not high to begin with. Just Host is a hosting provider based in the US that offers an average uptime of 99.98%. They offer cheap plans with no hidden charges and plans have all the necessary features covered. They also provide instant server provisioning which allows your website to be up on the internet quickly. Just Host integrates with hundreds of applications so the possibilities are endless. Just Host offers a singular web hosting plan for businesses that are looking for an all-inclusive plan at an affordable price. The plan starts at $3.95 per month for the first term at discount. With robust technology, customized support, and great uptime, your website is sure to be a success. You can be at ease knowing that your website is being hosted on a reliable server. If you choose to host your website on a VPS, you get instant provisioning at Just Host. With resources assured for your website, there is never a moment your website is not functioning at its best. There are four plans that differ by several parameters. Businesses can choose according to their data and storage usage. The best part is you get discount on these plans too. The dedicated hosting at Just Host is based on cloud infrastructure and managed. You get the best servers with instant provisioning. With RAID 1 mirrored storage, root access, and storage scalability; their dedicated servers are dedicated to providing the best services.